Atwater Brewery has been available here in San Antonio for a few years now. I have had 6 different beers from this Detroit, MI based brewery. This is the first to grace the BeerMetalDude site.I am a fan of the Doppelbock style. I love the heavy caramel flavor that is normal in this style. I picked this beer up locally at Total Wine. Let’s see my tasting notes, shall we? Before we get into the tasting notes, you know I love to talk about the beer labels. This one doesn’t have a completely eye catching label, but it does feature a skull on it, so obviously this attracted me towards the bottle on the shelf in the store. The problem here is that I don’t know what the name of the beer means, so I don’t know how the label art ties in, exactly. As with most other Atwater beers I’ve seen around town, this one has a background that looks like a flag with intersecting lines with their circle logo in the middle. This one is colored perfectly for the name of the beer. Bright green faded to black is majority of the label. The skull with no bottom jaw is sitting in the bottom corner. The skull is wearing a hat, and has red paint designs over the eye sockets. The name of the beer is written in a blood or slime looking font in bright green with a blood red shadow underneath. That name pops out the most on this label. As I said, it’s nothing special, but still caught my attention. I used a recommended glass style, a beer mug for this session. Voodoo Vator poured an opaque dark brown that was near black. Looks like Cola. It was topped with an inch wide light tan head, which quickly went down to a thin layer, but leaving no lacing at all. The aroma was strong caramel upfront that stuck around in the nose for a while after each whiff. Other scents I was able to pick up on were chocolate, milk, toffee, dark bread, raisins, figs, a little coffee, some clove, star anise, and earthy hops. The lingering aroma is sweet caramel, milk, and dark bread. The body was medium with mild carbonation, a creamy and sticky mouthfeel with a slightly dry finish. Overall, this beer was not bad. A good representation of the style. It did not knock me off my feet or anything, but I will return to this brew again, as long as I can get a hold of it.Come to think of it, I t has been a while since I have seen Atwater beers in San Antonio, or maybe I’m just not looking hard enough. Either way, if you haven’t had this beer yet, go out and try a bottle. I am sure you will enjoy it! Cheers! Metal Connection: Ah yes, the soothing sound of Jazz, err, I mean Ghoul. This Death/Thrash/Grindcore outfit from Oakland, CA has gained some massive fame over the years, and even incorporating a large stage show in their live act, kind of like GWAR. In fact, Ghoul has toured with GWAR, and the embers even act as stage hands and characters in GWAR’s live show. The one thing I love about Ghoul is that they stayed true to their sound even though there is a bit of fame under their belt. I have seen bands change their entire world over time, but not these guys! The members of Ghoul wear costumes on stage with bloody sacks draped over their heads,and flannels, jean jackets, and the like, similar to old 80’s serial killers in movies. The members of this band are no strangers, even though they try to hide their identity. The man two guys Digestor is Sean “Bloodbath” McGrath, and Cremator is Ross Sewage, both are known for their work with the Death Metal/Grindcore bands, Exhumed and Impaled. The song chosen here is called “The Mark of VooDoo” comes from the band’s 4th studio album, Transmission Zero, released on Tankcrimes Records in 2011. This song is dirty, disgusting, raw, and full of aggressive power. Circle pits galore during their lie shows wen this song comes on, I bet. Complete mass carnage! 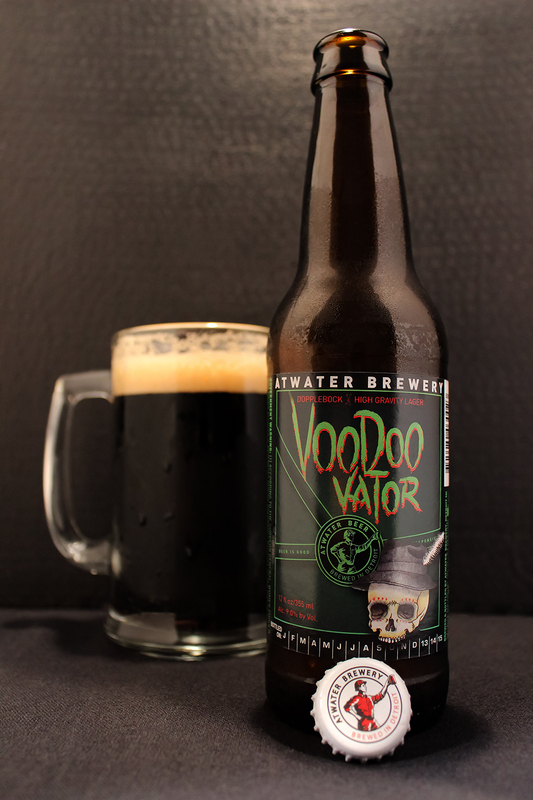 Enjoy this slab of sickness while knocking back a bottle of Atwater’s Voodoo Vator Doppelbock! Blegh!